European pillows are hard to find and I’m so glad that overstock had the answer! These are plush and perfect! I will be buying more... fast shipping and a great fit for covers. Add a touch of plush comfort to your home with this set of two European square pillows. 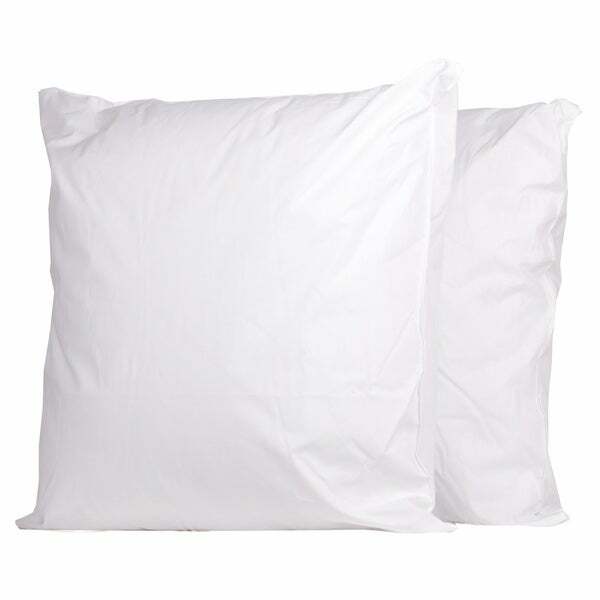 Crafted with 300 thread count cotton fabric and micropolyester fill, the pillow provides a touch of cozy softness. The crisp white color pairs beautifully with your existing decor. Poorly made. Was not true to the dimensions. The pillows were very poorly made. The dimensions stated on packaging was 26" x 26" and were 20" x 23". Were not stuffed properly. The stuffing is very poor quality material. This was the 3rd set of pillows sent. I will never order pillows from Overstock again. Terrible experience. These pillows are the bottom of the barrel as far as quality goes. So much for ordering the largest size since the stuffing is so much smaller than the casing. Stuffing is misshapen. Do not order these pillows. These pillows are just what I was looking for. Most pillows give me neck pain and these are comfortable. I will reorder these same pillows when needed. They are soft and comfortable and conform to my neck. Perfect. Pillows actually were not the right size, but that was my miscalculation, The pillows are soft and of good quality. Very nice pillows and they are so soft. I look forward to using them and feeling like I'm in a pampered spa! nice but came in box out of shape!!! Good price and I need pillows to fill the shams I just ordered. Just brought a new comforter set and need this type of pillow. needed them after ordering a comforter set.